Groupama sailing team took up a strong position to the east of the fleet on Sunday, after a radical move that could give the French team a real advantage on Leg 4. On a cold, dark day, heavy with rain, Franck Cammas’ Groupama 4, the green mosquito that has been buzzing in the ears of leg leaders CAMPER with Emirates Team New Zealand for days, broke away at around 0100 UTC — a move CAMPER chose not to follow. The key to the leg will likely be how the teams cross a windless zone to reach the northeast trade winds, which will take them swiftly towards the finish in Auckland. "We prefer to go away from this light wind area, but we won’t be able to entirely avoid it and will have to go through calm areas before we reach the trades," Cammas explained. Groupama may now have the edge over PUMA Ocean Racing powered by BERG, 27 nautical miles (nm) to their north, as well as the rest of the fleet, including CAMPER, 103 nm to their south, all of whom have very unstable wind. On board CAMPER, all is silent, except for the drumming of rain on the deck as the crew contemplates the anxious feeling that the fleet is roaring up behind. "It’s really hard to know right now just how we are doing against the other boats, until we manage to get into the established northeast trade winds and turn towards home," wrote CAMPER’s MCM Hamish Hooper. "The team studies the three-hourly position reports intently, working out the speeds and positions of the opposition, all the time hoping they are not doing better for too long. It’s a nervous time for skipper Chris Nicholson." Meanwhile, PUMA have concluded their lonely detour to the north, which has brought them back within range of the fleet just 28 nm to the north of Groupama 4. "The important thing is that PUMA has some swagger back," wrote MCM Amory Ross. "The guys are smiling, spirits are high, and we’ve mostly forgotten the last week of torture in favor of more recent reaching pleasantries. I say mostly because everyone owns some lingering bumps and bruises we tend to revisit now and again." Skipper Ken Read came up with an original way of describing the relief on board at being back with the fleet. "I think I have a splinter in my right hand," Read said. "The term ‘touch wood’ has been used more times than I have ever heard. The little piece of wood mounted in the nav table is nearly worn out. The sentence, ‘if it works the way it is supposed to, we will be ok – touch wood’, has been used a thousand times." Overall leaders Team Telefónica, placed second on the leg leaderboard, are over 161 nm south of PUMA. Their position near the top is distorted by their position as the furthest boat to the south. However, Navigator Andrew Cape says it’s not all over yet. "Without doubt we’re still looking at the number one position here," he said. "It’s not over, we’re not in the gutter being kicked in the head. We have our heads held high, a lot of fight left in us and a long way to go." According to skipper Mike Sanderson, fourth placed Team Sanya are not on the ‘front row of the grid’ either. "I can’t really blame our further loss on performance, although being behind in the first place has caused us to get held up in between two weather systems," Sanderson said. The new reaching conditions expected in about 48 hours will not suit Team Sanya, who will be hoping for a ‘restart’ in the doldrums area around the Solomon Islands. Their spirits, however, were lifted today by the appearance of a pod of dolphins hunting tuna and an eight-metre whale shark, whose body was just visible with a big dorsal fin breaking the surface. Abu Dhabi Ocean Racing are in fifth, tracing the wake of Groupama 4. "We’re pretty much in the hunt, but we’ve had a tough 24 hours," explained bowman Justin Slattery. "When we start heading south and we get those blue skies, I think it will lift our moods considerably." The fleet is separated by a weakening cold front, which is causing cloudiness and unstable breeze. While everything is looking good for PUMA and Groupama in the north, it could be a much more painful transition to the trade winds with a less favourable angle for Telefónica and CAMPER who are stuck in the centre of the front. 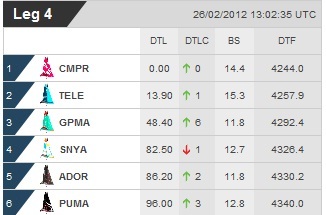 On the 1300 UTC leader board today, CAMPER showed a slim margin of 13.9 nm over Telefónica, although their real threat could be from PUMA and Groupama in the north. The current leg placings are distorted by the distance to finish calculation and it will not become clear who the winners and losers are until the transition into the trade winds is complete, which will be Tuesday at the earliest.